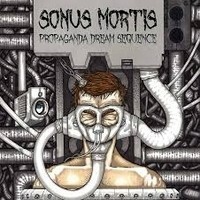 SONUS MORTIS was formed in 2013 by Kevin Byrne. They are described as a Death / Doom Metal band, with some Symphonic / Atmospheric / Black elements, and are from Dublin, Ireland. Following a 2013, three-track demo release, this new 2014 album contains eleven tracks. “The Cyber Contruct” leads off the album. Fairly quickly you realize you are in the middle of a grand composition. The vocals are the traditional death style, but there is a lot going on all around you. The main riff is bossy, gritty and powerful, and there is an air of impending doom, as if you were in the middle of a vortex, safe only for this moment. “Propaganda Dream Sequence” is just lovely. An airy riff carries just enough keys along with some varied vocal techniques, and the alignment shifts from good too bad along the way. As in many Doom songs, hope is quickly replaced with despair, as the more brutal elements enter the fray. “To Lament, Morn and Regret” comes in with more assertion, but no less fervor, while “Enter Oblivion” has this bright and wondrous keyboard chord progression quality behind the up-front, grinding rhythm and potency. Here again we hear that perfect connection of two opposing concepts in the music. The complexity and sheer evil quality of a band like DIMMU BORGIR can be heard in the track “The Flock Obscenity,” with all of the symphonic elements that come along with it, while “Automated Future” is an exercise in a cold, industrial proposition, but with some melody sprinkled on top. As the album progresses I believe we are firmly rooted in Kevin’s world. “A Doctrine for the End Times” is just that, a loitering and measured dose of cheerlessness, told in short vocal passages that just linger with lamentation. All the while, the rhythm comes at you over and over, like waves of despair. “Decompression Countdown” might be even deeper and darker, with a sound reminiscent of early SWALLOW THE SUN for me. Might and potency return full stage with “And the Foundations Start to Decay”, with a chorus that features some clean vocals, and a soft, piano carrying the melody to the end of the song. “Scolecophagus” might represent the more straightforward power of the album, with a lengthy track of traditional Death and Doom. Closing the album is the masterpiece “The Ephemeral Sempiternity of Time”. In lay terms, a short-lived, temporary infiniteness? Though the words themselves form an oxymoron, the music reflects that definition precisely. It is a more of a reflection of the elements Kevin uses in these subgenres so effectively. One minute there is hope, the next there is despair. How long each feeling lasts is what makes the music so well composed. In sum, It is difficult to comprehend that one person wrote and performed all of this. The album is supremely balanced, and flows very well considering all of the elements Kevin is able to work into each song. The tracks are thick, deep, strong, and intricate, but all with the unmistakable might and punch of Death and Doom Metal.